WIRELESS CAMERA SHUTTER REMOTE: Perfect for taking selfies or group shots (including the photographer) from a distance of up to 30 feet (10 m). You only need to pair the remote control with your smartphone once. Then choose the camera app you want to use and press the button of the remote control to capture that awesome picture! 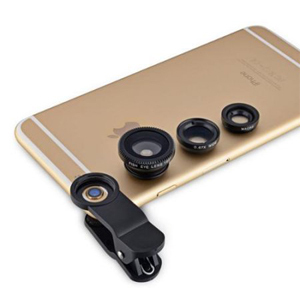 THREE GREAT LENSES IN ONE KIT: Awesome mobile photography for back or front facing cameras. Includes 3 quick connect lenses: fisheye lens, macro lens and wide angle lens. Combine with your favorite apps to share photos instantly. 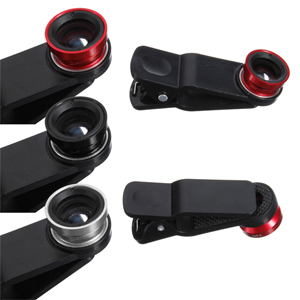 UNIVERSAL LENS CLIP: The lenses included in this set can be used with a wide range of cell phones and mobile devices including iPhone 7, SE, 6S Plus, 6S, 6 Plus, 6, 5S, 5C, 5; Samsung Galaxy S7 Edge, S7, S6 Edge plus, S6 Edge, S6, S5, S5 mini and many more (not suitable for iPhone 7 Plus). FOUR GREAT LENSES IN ONE KIT: Awesome mobile photography for back or front facing cameras. Includes 4 lenses – 12x zoom telephoto lens with manual focus ring, fisheye lens, macro lens and wide angle lens. Combine with your favorite apps to share photos instantly. UNIVERSAL PHONE HOLDER CAN BE USED WITH MULTIPLE DEVICES AND MOUNTS: The universal holder can be used with a variety of phones, not just the iPhone 6/6s. It also features a standard tripod socket, so it can be used with most tripods and monopods, not just the one included in the kit. 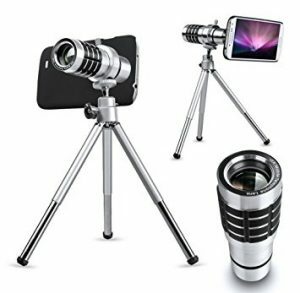 FOUR GREAT LENSES IN ONE KIT: Awesome mobile photography for Apple iPhone 7 (not suitable for iPhone 7 Plus). Includes 4 lenses: 12x zoom telephoto lens with manual focus ring, fisheye lens, macro lens and wide angle lens. All lenses are made from aluminum for increased durability. Combine with your favorite apps to share photos instantly! UNIVERSAL PHONE HOLDER CAN BE USED WITH MULTIPLE DEVICES AND MOUNTS: The universal holder can be used with a variety of phones, not just the iPhone 7 (not suitable for iPhone 7 Plus). It also features a standard tripod socket, so it can be used with most tripods and monopods, not just the one included in the kit. Get a clear shot of subjects usually too far away to capture with your cell phone lens. Use the manual focus ring to get a clear and crisp image. EASY TO INSTALL AND USE: Comes with 4 pcs installation cases for iPhone 6 / 6s / 6 plus / 6s plus / 7 / 7 plus. 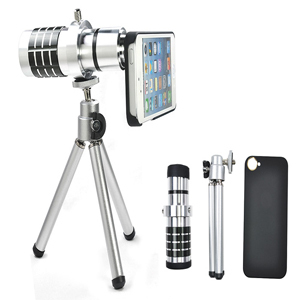 This lens kit also comes with a mini tripod , so you can position your device more precisely. 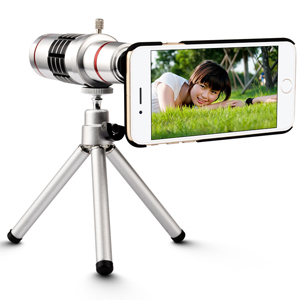 MINI TRIPOD designed to support video and still shots while keeping your camera steady. Compact design provides an easy way to take it everywhere you go! 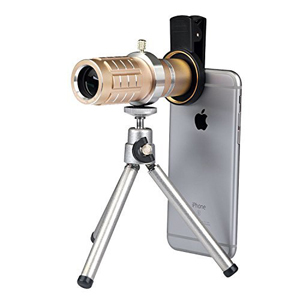 The universal TRIPOD ADAPTER can be used with a variety of phones, not just the iPhone. It also features a standard tripod socket, so can be used with most tripods.